Establishing and maintaining a coherent enterprise architecture is clearly a complex task, because it involves many different people with differing backgrounds using various notations. In order to get a handle on this complexity, researchers have initially focused on the definition of architectural frameworks for classifying and positioning the various architectural descriptions with respect to each other (e.g., the Zachman framework , ). A problem with looking at enterprise architecture through the lens of an architectural framework is that it categorizes and divides architectural descriptions rather than providing insight into their coherence. ArchiMate advocates a more flexible approach in which architects and other stakeholders can define their own views on the enterprise architecture. In this approach, views are specified by viewpoints. Viewpointsdefine abstractions on the set of models representing the enterprise architecture, each aimed at a particular type of stakeholder and addressing a particular set of concerns. Viewpoints can both be used to view certain aspects in isolation, and for relating two or more aspects. The notion of viewpoint-oriented architecture has been around for a while in requirements and software engineering. In the 1990s, a substantial number of researchers worked on what was phrased as “the multiple perspectives problem” , . By this term they referred to the problem of how to organize and guide (software) development in a setting with many actors, using diverse representation schemes, having diverse domain knowledge and different development strategies. A general framework has been developed in order to address the diverse issues related to this problem , . In this framework, a viewpoint combines the notion of “actor”, “role”, or “agent” in the development process with the idea of a “perspective” or “view” which an actor maintains. More precisely, viewpoints are defined as loosely coupled, locally managed, distributable objects; thus containing identity, state, and behavior. A viewpoint is more than a “partial specification”; in addition, it contains partial knowledge of how to develop that partial specification. These early ideas on viewpoint-oriented software engineering have found their way into ISO/IEC 42010:2007  on which we have based our definitions below. 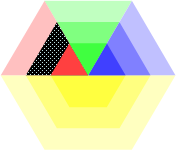 As a result of these ideas, several architecture frameworks can be found in the field of literature, which are essentially viewpoint classification schemes. For example, the Zachman framework ,  divides the enterprise architecture into 36 different enterprise-wide “architectures” (i.e., viewpoints). Tapscott and Caston’s framework  distinguishes five different and complementing viewpoints: business, work, information, application, and technology. Kruchten  introduces the “4+1” method, in which four views (logic, process, development, and physical), each having its own notation, are coupled through a fifth view: the scenario view illustrating the collaboration between the other four views. Viewpoints are also prominently present in the ISO standardized Reference Model for Open Distributed Processing (RM-ODP) . The RM-ODP identifies five viewpoints from which to specify ODP systems, each focusing on a particular area of concern; i.e., enterprise, information, computational, engineering, and technology. It is claimed that the ODP viewpoints form a necessary and sufficient set to meet the needs of ODP standards. 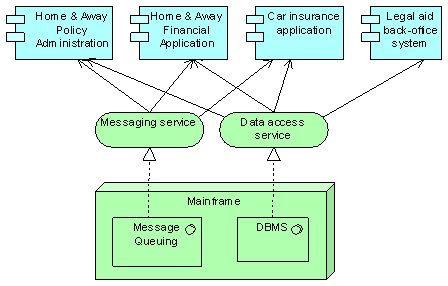 More recently, the term “viewpoint” is also used in OMG’s Model Driven Architecture (MDA) initiative to refer to the different model types; i.e., Platform-Independent Model (PIM) and Platform-Specific Model (PSM) . Hence, we conclude that the use of viewpoints and architectural views are well-established concepts in software architecture. In the domain of enterprise architecture, the TOGAF framework describes a taxonomy of views for different categories of stakeholders. Next to this description of views, TOGAF also provides guidelines for the development and use of viewpoints and views in enterprise architecture models. The views and viewpoints proposed by any of the above mentioned frameworks should not be considered in isolation: views are inter-related and, often, it is exactly a combination of views together with their underlying inter-dependency relationships the best way to describe and communicate a piece of architecture. It should, however, be noted that views and viewpoints have a limiting character. They are eventually a restriction of the whole system (and architecture) to a partial number of aspects – a view is just a partial incomplete depiction of the system. Views are an ideal mechanism to purposefully convey information about architecture areas. 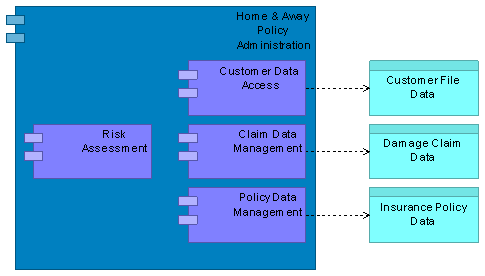 In general, a view is defined as a part of an architecture description that addresses a set of related concerns and is addressed to a set of stakeholders. A view is specified by means of a viewpoint, which prescribes the concepts, models, analysis techniques, and visualizations that are provided by the view. Simply put, a view is what you see, and a viewpoint is where you are looking from. Viewpoints are a means to focus on particular aspects of the architecture. These aspects are determined by the concerns of a stakeholder with whom communication takes place. What should and should not be visible from a specific viewpoint is therefore entirely dependent on the argumentation with respect to a stakeholder’s concerns. Viewpoints are designed for the purpose of communicating certain aspects of an architecture. The communication enabled by a viewpoint can be strictly informative, but in general will be bi-directional. The architect informs stakeholders, and stakeholders give their feedback (critique or consent) on the presented aspects. What is and what is not shown in a view depends on the scope of the viewpoint and on what is relevant to the concerns of the stakeholder. Ideally, these are the same; i.e., the viewpoint is designed with specific concerns of a stakeholder in mind. 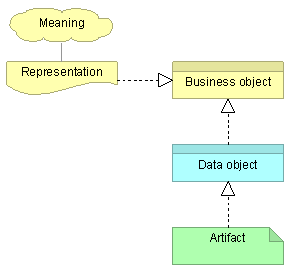 Relevance to a stakeholder’s concern, therefore, is the selection criterion that is used to determine which objects and relations are to appear in a view. End user: For example, what are the consequences for his work and workplace? Architect: What is the consequence for the maintainability of a system, with respect to corrective, preventive, and adaptive maintenance? Upper-level management: How can we ensure our policies are followed in the development and operation of processes and systems? What is the impact of decisions (on personnel, finance, ICT, etc.)? Operational manager, responsible for exploitation or maintenance: For example, what new technologies are there to prepare for? Is there a need to adapt maintenance processes? What is the impact of changes to existing applications? How secure are my systems? Project manager, responsible for the development of new applications: What are the relevant domains and their relations? What is the dependence of business processes on the applications to be built? What is their expected performance? Developer: What are the modifications with respect to the current situation that need to be done? Designing: Design viewpoints support architects and designers in the design process from initial sketch to detailed design. 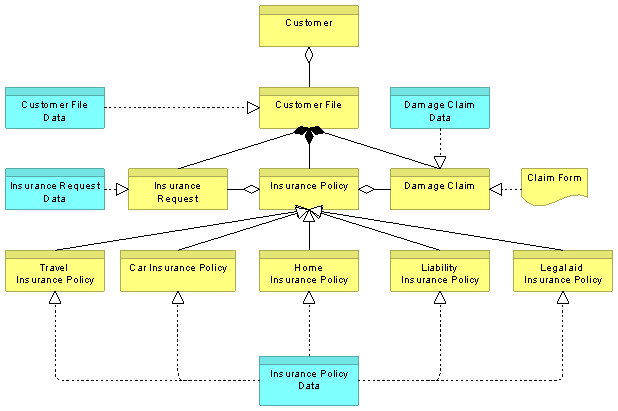 Typically, design viewpoints consist of diagrams, like those used in, for example, UML. 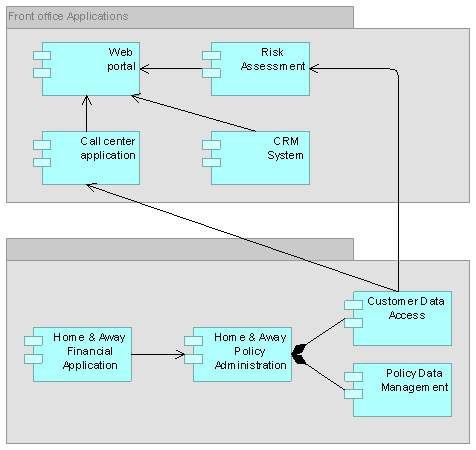 Deciding: Decision support viewpoints assist managers in the process of decision-making by offering insight into cross-domain architecture relations, typically through projections and intersections of underlying models, but also by means of analytical techniques. Typical examples are cross-reference tables, landscape maps, lists, and reports. Informing: Informing viewpoints help to inform any stakeholder about the enterprise architecture, in order to achieve understanding, obtain commitment, and convince adversaries. Typical examples are illustrations, animations, cartoons, flyers, etc. The goal of this classification is to assist architects and others find suitable viewpoints given their task at hand; i.e., the purpose that a view must serve and the content it should display. With the help of this framework, it is easier to find typical viewpoints that might be useful in a given situation. This implies that we do not provide an orthogonal categorization of each viewpoint into one of three classes; these categories are not exclusive in the sense that a viewpoint in one category cannot be applied to achieve another type of support. 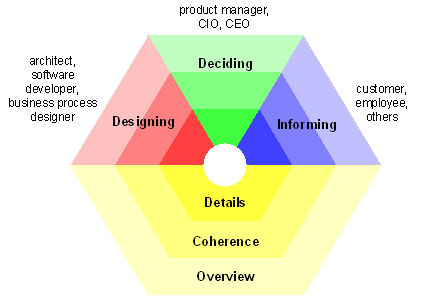 For instance, some decision support viewpoints may be used to communicate to any other stakeholders as well. Details: Views on the detailed level typically consider one layer and one aspect from the ArchiMate framework. Typical stakeholders are a software engineer responsible for design and implementation of a software component or a process owner responsible for effective and efficient process execution. 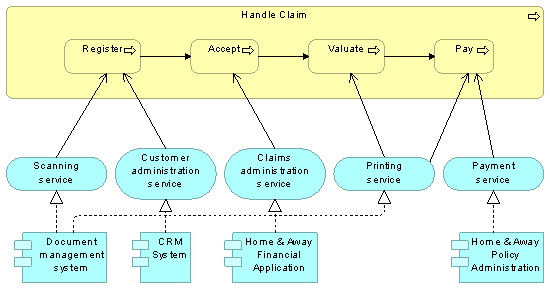 Examples of views are a BPMN process diagram and a UML class diagram. 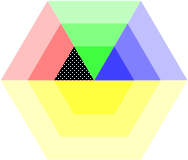 Coherence: At the coherence abstraction level, multiple layers or multiple aspects are spanned. Extending the view to more than one layer or aspect enables the stakeholder to focus on architecture relations like process-uses-system (multiple layer) or application-uses-object (multiple aspect). Typical stakeholders are operational managers responsible for a collection of IT services or business processes. 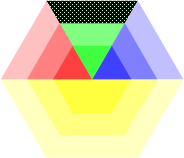 Overview: The overview abstraction level addresses both multiple layers and multiple aspects. Typically, such overviews are addressed to enterprise architects and decision-makers, such as CEOs and CIOs. In Figure 54, the dimensions of purpose and abstraction level are visualized in a single picture, together with examples of stakeholders. Table 5 and Table 6 summarize the different purposes and abstraction levels. 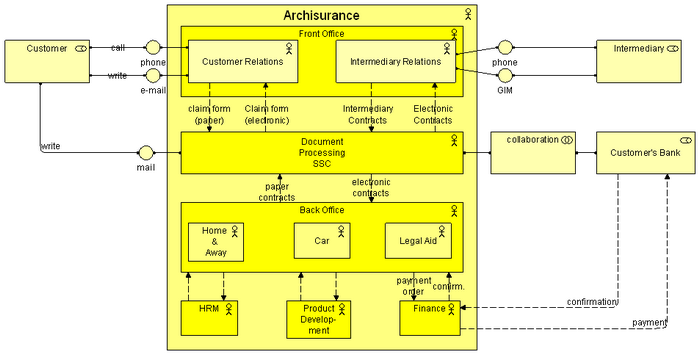 The basic viewpoint in ArchiMate is a selection of a relevant subset of the ArchiMate concepts (and their relations) and the representation of that part of an architecture that is expressed in different diagrams. A set of such viewpoints was developed based on practical experience. 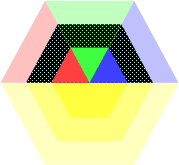 Some of these viewpoints have a scope that is limited to a single layer or aspect. Thus, the Business Function and Business Process viewpoints show the two main perspectives on the business behavior; the Organization viewpoint depicts the structure of the enterprise in terms of its departments, roles, etc. 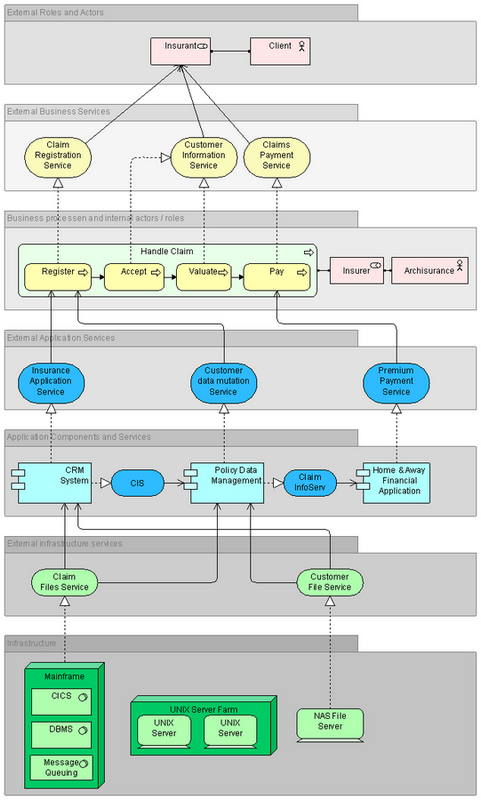 ; the Information Structure viewpoint describes the information and data used; the Application Structure, Behavior, and Co-operation viewpoints contain the applications and components and their mutual relations; and the Infrastructure viewpoint shows the infrastructure and platforms underlying the enterprise’s information systems in terms of networks, devices, and system software. 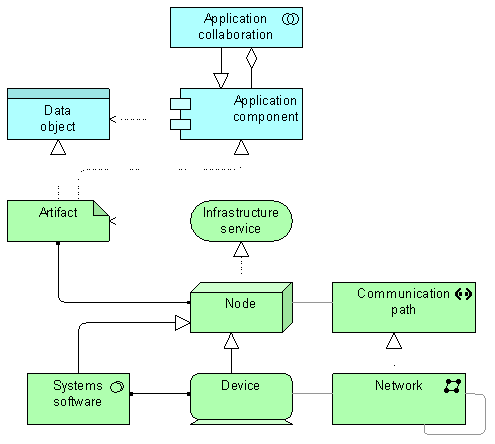 Other viewpoints link multiple layers and/or aspects: the Actor Co-operation and Product viewpoints relate the enterprise to its environment; the Application Usage viewpoint relates applications to their use in, for example, business processes; and the Deployment viewpoint shows how applications are mapped onto the underlying infrastructure. In the following sections, all ArchiMate viewpoints are separately described in detail. For each viewpoint the comprised concepts and relations, the guidelines for the viewpoint use, and the goal and target group and of the viewpoint are indicated. 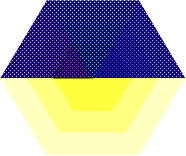 Furthermore, each viewpoint description contains example models. For more details on the goal and use of viewpoints, refer to , Chapter 7. The Introductory viewpoint forms a subset of the full ArchiMate language using a simplified notation. It is typically used at the start of a design trajectory, when not everything needs to be detailed yet, or to explain the essence of an architecture model to non-architects that require a simpler notation. Another use of this basic, less formal viewpoint is that it tries to avoid the impression that the architectural design is already fixed, an idea that may easily arise when using a more formal, highly structured or detailed visualization. We use a simplified notation for the concepts, and for the relations. All relations except “triggering” and “realization” are denoted by simple lines; “realization” has an arrow in the direction of the realized service; “triggering” is also represented by an arrow. The concepts are denoted with slightly thicker lines and rounded corners, which give a less formal impression. The example below illustrates this notation. 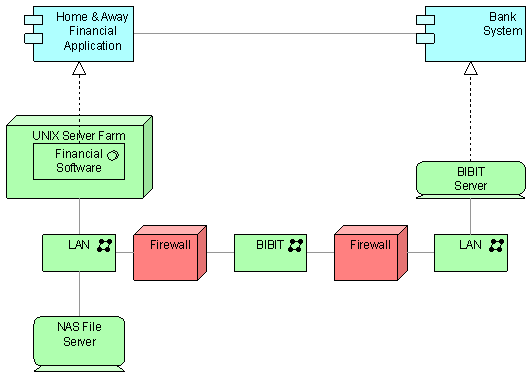 On purpose, the layout of this example is not as “straight” as an ordinary architecture diagram; this serves to avoid the idea that the design is already fixed. The Organization viewpoint focuses on the (internal) organization of a company, a department, a network of companies, or of another organizational entity. It is possible to present models in this viewpoint as nested block diagrams, but also in a more traditional way, such as organizational charts. The Organization viewpoint is very useful in identifying competencies, authority, and responsibilities in an organization. The Actor Co-operation viewpoint focuses on the relations of actors with each other and their environment. 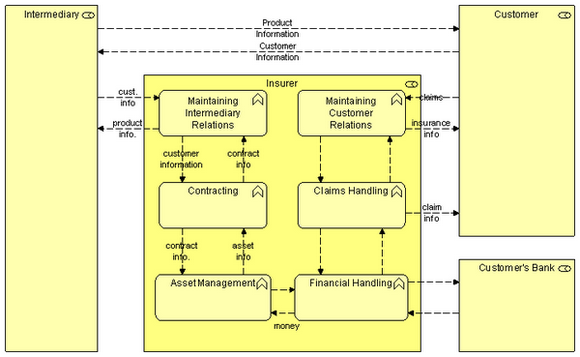 A common example of this is the “context diagram”, which puts an organization into its environment, consisting of external parties such as customers, suppliers, and other business partners. It is very useful in determining external dependencies and collaborations and shows the value chain or network in which the actor operates. 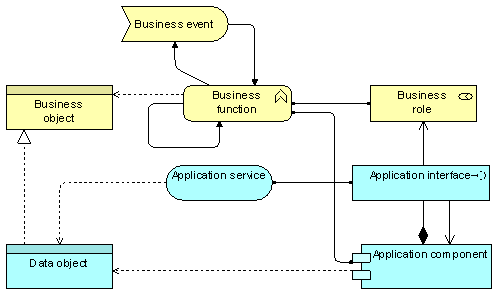 Another important use of the Actor Co-operation viewpoint is in showing how a number of co-operating business actors and/or application components together realize a business process. Hence, in this view, both business actors or roles and application components may occur. The Business Function viewpoint shows the main business functions of an organization and their relations in terms of the flows of information, value, or goods between them. Business functions are used to represent the most stable aspects of a company in terms of the primary activities it performs, regardless of organizational changes or technological developments. Therefore, the business function architecture of companies that operate in the same market often exhibit close similarities. The business function viewpoint thus provides high-level insight in the general operations of the company, and can be used to identify necessary competencies, or to structure an organization according to its main activities. Each of these can be regarded as a “sub-view” of the business process view. Each of these can be regarded as a “sub-view” of the business process co-operation view. The Product viewpoint depicts the value these products offer to the customers or other external parties involved and shows the composition of one or more products in terms of the constituting (business or application) services, and the associated contract(s) or other agreements. It may also be used to show the interfaces (channels) through which this product is offered, and the events associated with the product. A Product viewpoint is typically used in product development to design a product by composing existing services or by identifying which new services have to be created for this product, given the value a customer expects from it. It may then serve as input for business process architects and others that need to design the processes and ICT realizing these products. The Application Behavior viewpoint describes the internal behavior of an application; e.g., as it realizes one or more application services. This viewpoint is useful in designing the main behavior of applications, or in identifying functional overlap between different applications. 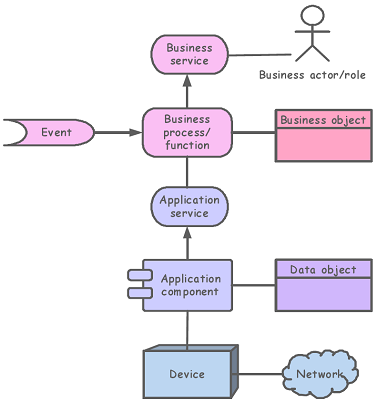 The Application Co-operation viewpoint describes the relations between applications components in terms of the information flows between them, or in terms of the services they offer and use. This viewpoint is typically used to create an overview of the application landscape of an organization. This viewpoint is also used to express the (internal) co-operation or orchestration of services that together support the execution of a business process. 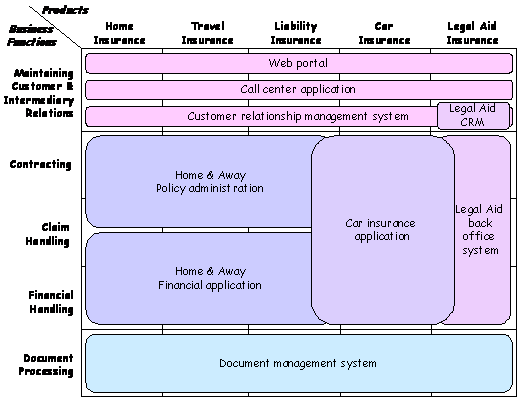 The Application Structure viewpoint shows the structure of one or more applications or components. This viewpoint is useful in designing or understanding the main structure of applications or components and the associated data; e.g., to break down the structure of the system under construction, or to identify legacy application components that are suitable for migration/integration. The Application Usage viewpoint describes how applications are used to support one or more business processes, and how they are used by other applications. It can be used in designing an application by identifying the services needed by business processes and other applications, or in designing business processes by describing the services that are available. Furthermore, since it identifies the dependencies of business processes upon applications, it may be useful to operational managers responsible for these processes. 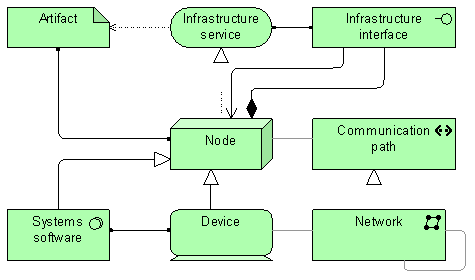 The Infrastructure viewpoint contains the software and hardware infrastructure elements supporting the application layer, such as physical devices, networks, or system software (e.g., operating systems, databases, and middleware). 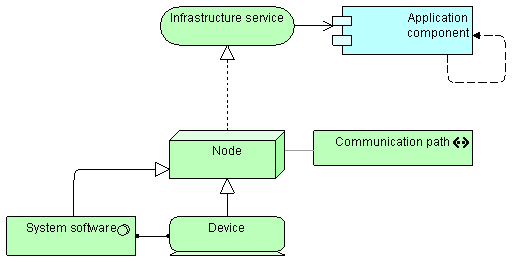 The Infrastructure Usage viewpoint shows how applications are supported by the software and hardware infrastructure: the infrastructure services are delivered by the devices; system software and networks are provided to the applications. This viewpoint plays an important role in the analysis of performance and scalability, since it relates the physical infrastructure to the logical world of applications. It is very useful in determining the performance and quality requirements on the infrastructure based on the demands of the various applications that use it. 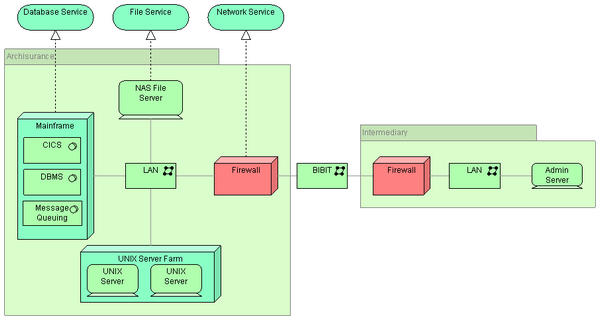 The Implementation and Deployment viewpoint shows how one or more applications are realized on the infrastructure. This comprises the mapping of (logical) applications and components onto (physical) artifacts, such as Enterprise Java Beans, and the mapping of the information used by these applications and components onto the underlying storage infrastructure; e.g., database tables or other files. Deployment views play an important role in the analysis of performance and scalability, since they relate the physical infrastructure to the logical world of applications. 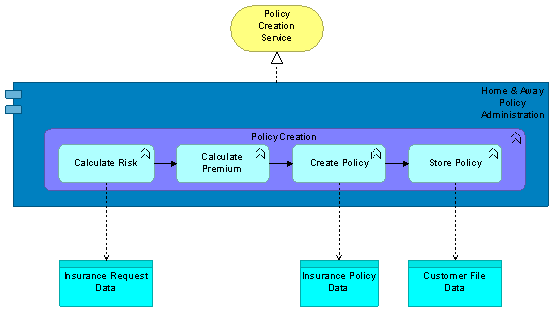 In security and risk analysis, deployment views are used to identify, for example, critical dependencies and risks. 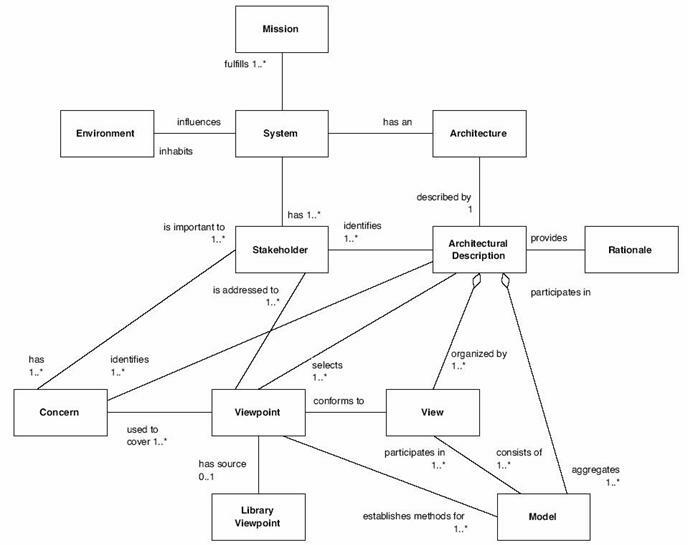 The Information Structure viewpoint is comparable to the traditional information models created in the development of almost any information system. It shows the structure of the information used in the enterprise or in a specific business process or application, in terms of data types or (object-oriented) class structures. Furthermore, it may show how the information at the business level is represented at the application level in the form of the data structures used there, and how these are then mapped onto the underlying infrastructure; e.g., by means of a database schema. 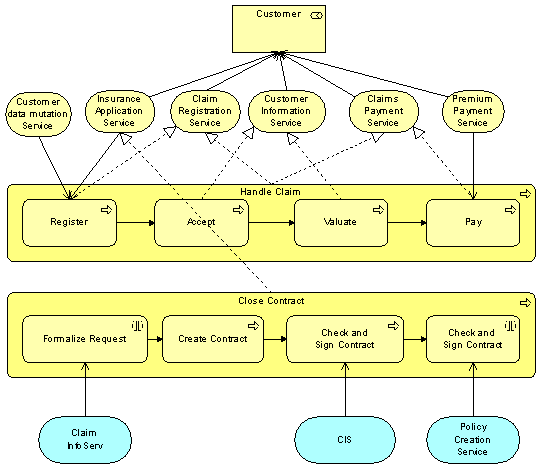 The Service Realization viewpoint is used to show how one or more business services are realized by the underlying processes (and sometimes by application components). Thus, it forms the bridge between the business products viewpoint and the business process view. It provides a “view from the outside” on one or more business processes. The Layered viewpoint pictures several layers and aspects of an enterprise architecture in one diagram. 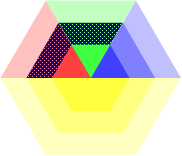 There are two categories of layers, namely dedicated layers and service layers. The layers are the result of the use of the “grouping” relation for a natural partitioning of the entire set of objects and relations that belong to a model. The infrastructure, the application, the process, and the actors/roles layers belong to the first category. 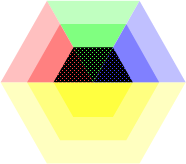 The structural principle behind a fully layered viewpoint is that each dedicated layer exposes, by means of the “realization” relation a layer of services, which are further on “used by” the next dedicated layer. Thus, we can easily separate the internal structure and organization of a dedicated layer from its externally observable behavior expressed as the service layer that the dedicated layer realizes. The order, number, or nature of these layers are not fixed, but in general a (more or less) complete and natural layering of an ArchiMate model will contain the succession of layers depicted in the example given below. However, this example is by no means intended to be prescriptive. The main goal of the Layered viewpoint is to provide overview in one diagram. Furthermore, this viewpoint can be used as support for impact of change analysis and performance analysis or for extending the service portfolio. All concepts and all relations. A landscape map is a matrix that represents a three-dimensional coordinate system that represents architectural relations. The dimensions of the landscape maps can be freely chosen from the architecture that is being modeled. In practice, often dimensions are chosen from different architectural domains; for instance, business functions, application components, and products. Note that a landscape map uses the ArchiMate concepts, but not the standard notation of these concepts. 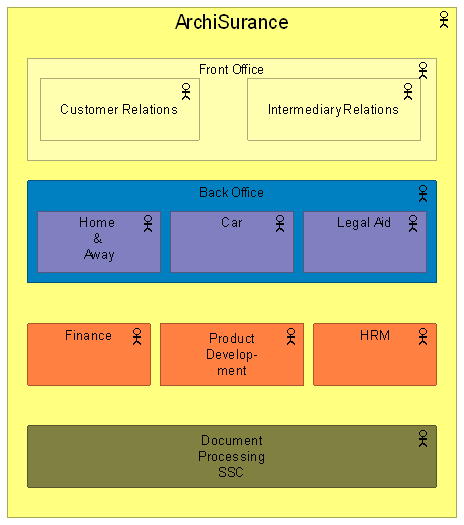 In most cases, the vertical axis represents behavior like business processes or functions; the horizontal axis represents “cases” for which those functions or processes must be executed, such as different products, services market segments, or scenarios; the third dimension represented by the cells of the matrix is used for assigning resources like information systems, infrastructure, or human resources. The value of cells can be visualized by means of colored rectangles with text labels. Obviously, landscape maps are a more powerful and expressive representation of relations than traditional cross tables. They provide a practical manner for the generation and publication of overview tables for managers, process, and system owners. Furthermore, architects may use landscape maps as a resource allocation instrument and as an analysis tool for the detection of patterns and changes in this allocation. Downloads of the ArchiMate documentation, are available under license from the ArchiMate information web site. 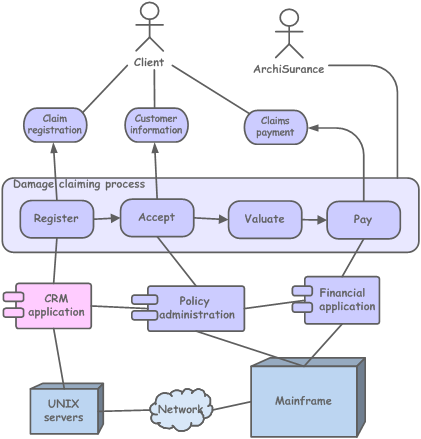 The license is free to any organization wishing to use ArchiMate entirely for internal purposes (for example, to develop an information system architecture for use within that organization). A book is also available (in hardcopy and pdf) from The Open Group Bookstore as document C091.